Pump Aid adapted the Chinese rope design using locally available materials ensuring its strength and sustainability. The pump can lift water from as deep as 30m. The location of a well is determined by geological formations and vegetation growth with input made by the water diviners in the Pump Aid team. Wells are dug by hand but Pump Aid teams may need to help to remove rocks and heavily impacted earth. Pump Aid never uses mechanical diggers because it would deprive someone a job and increase cost. In addition as we work in rural and remote locations it would be impossible to bring in machinery. As the Pump handle is turned, water is drawn up by plastic washers attached to a rope. 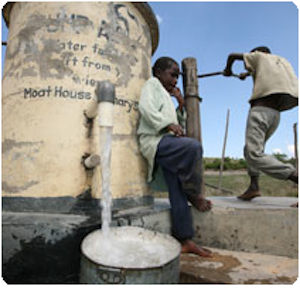 The Pumps are so easy to use that children as young as five years old can manage to pump out a bucket full of water. The Elephant Pump is encased in concrete to prevent any contamination, ensuring that a clean sustainable supply of water is provided for the local community for many years to come. If an Elephant Pump is installed at a school, then it will provide clean water for around 500 children and their teachers as well as up to a dozen families living near-by. Not only does this have the obvious health benefits but also encourages children to come to school!